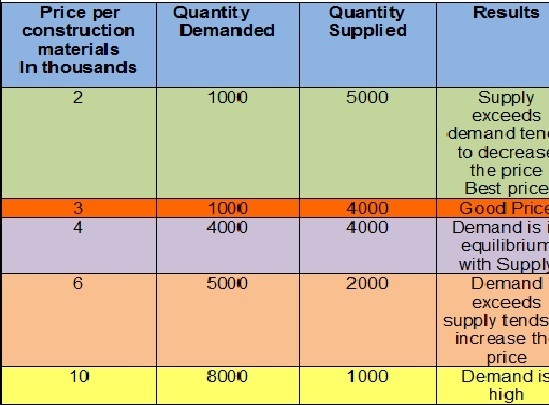 Demand and Supply and its effects on Building Materials and the influence on the construction Industry. Studies reported by business wire news evaluated several construction distributing markets and notice a huge rise in demand of commercial and residential buildings including newly land development projects set to take-off to support the demand. With a rise in DEMAND, the price factors will dramatically decrease due to the high volume of materials(SUPPLY) needed to meet the demand. Economic growth and rising population impact on the construction materials market, and profitability will be curbed by high-energy prices. Economic slowdown is also likely to cut profit as companies absorb input costs they can pass on in a stronger economic climate. The construction building materials market is expected to grow at more than 6% yearly through 2015 to reach almost $890 million, according to business wire. The industry encompasses cement, brick, concrete, sand, aggregates and gravel manufacturers. Cement manufacturing was the most dynamic market segment in 2010, reaching close to $200 million, or nearly a third of the overall global market. Among the most-used building materials are steel, glass, wood, plastics and cement commonly found in chain building stores such as HOME Depot Inc. HD. The industry segment are related wiring manufacturers and furniture manufacturers. The building materials market is fueled in a large part by green building, with this market segment worth over $60 million in the US. Green building is particularly popular in the residential market, lead by demand for such products as cork, bamboo and woven flooring. Concrete production from recycled materials is also a dynamic growth area within the industry, along with wood from sustainable forests, energy-efficient lighting fixtures and water-efficient plumbing fixtures. The green construction materials market is expected to exceed $405 million by 2015, according to Global Industry Analysts. Factors fuelling green building include falling green building material costs, rising energy costs, increasingly protective environmental legislation and general consumer awareness of environmental factors. The market will continue to expand because of consumer preference for green alternatives and pressure to optimize energy efficiency. The hydraulic cement markets are expected to rise more than 4% yearly to 3.5 million metric tons, representing overall worth in excess of $245 million by 2013, according to Business wire news. Emerging markets will see growth fuelled by infrastructure investment while developed countries will experience slower growth. Ready-mix concrete will remain the most dynamic growth sector through 2013, with blended cement gaining market share through 2013. China, which currently represents around 50% of global demand for cement, will see growth slow through 2013; India will see rapid growth. •The drywall markets are expected to grow more than 7.5% yearly through 2014 to over 10 million square meters, according to Business wire. Combined, the US and Asia-Pacific will represent around 80% of new product demand through 2014, with the US seeing 9% yearly growth. Growing populations and urban housing demand will make Asia-Pacific the fastest-growing market in the next four years. •Demand for gypsum-based building plasters is expected to grow at over 5% yearly to reach over 36 million metric tons in 2014.